Snack Girl hasn't sucked on a hockey puck lately, but she has grilled skinless chicken breast past the point of edible. In fact, my husband will not eat skinless chicken breast because he says it is too dry. This is a shame because 4 ounces of boneless, skinless chicken breast is very low in saturated fat and only 128 calories. A four ounce steak has 224 calories and almost 20% of your daily value of saturated fat (so sad). When you take the fat out of the chicken, you lose a lot of the flavor and moistness. On the other hand, you get a nutritionist's DREAM because skinless, boneless chicken breast is easy to find, high in protein, and low in fat. You need to treat chicken breast like any other tough piece of meat and cook it slowly. Cooking it at a high temperature for a long time in a slow cooker allows moisture from the braising liquid to seep in to the chicken. Basically, you are stewing it and my favorite sauce for stewing (when I am feeling lazy - which is all the time) is jarred salsa. I love this black bean and corn Mrs. Renfro's salsa that is just perfect for making chicken breast into a "Mexican" stew. We take the stewed chicken and serve it on tortillas with avocado, cheese, diced tomatoes, lettuce and have a taco night. This can be a great snack all on its own - and will completely fill you up until meal time. For those out there who hate to cook, this recipe isn't really cooking - but it will make you LOOK like you cooked something. 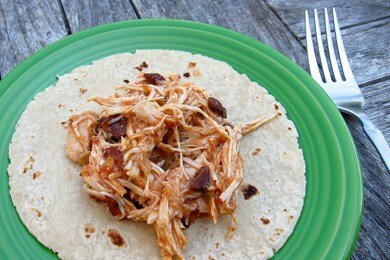 You are just putting 2 ingredients (chicken breast and salsa) in a slow cooker and turning it on. My 5 year old could handle this recipe (if he could just open a jar). What are your tricks for cooking chicken breasts? Coat a medium or large slow cooker with non-stick cooking spray. Add chicken breasts and pour salsa over them. Cover and cook on high for 3 to 3 1/2 hours. When cooked, shred chicken with a fork and squeeze lime juice into stew. Mix, taste, and adjust for salt. Serve over tortillas or rice. This stew will keep in the fridge for a week - and will freeze well. Who Else Lost Their Virginity This Month? This sounds so delicious and easy! Considering the cost of pre prepared chicken breasts, could this recipe be adapted to a whole chicken, or chicken pieces? I put a lot of water in the pan when I'm cooking chicken, almost boiling it. It doesn't brown (that is, it cooks, and unpinks, but doesn't get scorch marks or get goldeny), but that's not a big deal to me. But the water keeps it from getting dry at all - nice, moist, juicy chicken, with no added fat! @Anna - I think this would work with chicken pieces (needs to be cut up to fit under salsa) but I would remove the skin. Yes, boned chicken breasts are pricey! I cracked the mystery of cooking juicy boneless, skinless chicken breasts when I first moved out years ago: Broiler/Toaster Ovens. My fist boneless, skinless chicken breast spurted when I cut into it, it was so juicy. I usually just throw on a little garlic salt and they come out quite tasty. I haven't bought chicken breasts in about a year. I use drumsticks and thighs for everything. Although the breasts are high in protein, they offer little additional nutritional value. The dark meat contains more nutrients, and is cheaper to boot. Two words: meat tenderizer. This makes all the difference for us when we use boneless skinless, whether grilled, stovetop, or oven-prepared. It always comes out SO tender! Marinading the chicken overnight also helps to maintain the moistness. McCormick's makes a lot of great flavors! To save calories, you can replace half of the oil in their recipe with water and it still tastes great. The secret to making chicken that is tasty is to start out with a product not from a factory farm. I find this makes a HUGE difference. When the chicken is from a family farm = much more tasty and moist. Better for you too. Often Factory Farmed chicken is injected with salt water. I cook my boneless skinless chicken breast on the stovetop until heated through then I add a jar of salsa and cook long enough to warm the salsa up. I love this idea for cooking chicken breast, since I totally agree that on the grill it can come out dry and yucky. I like to cook it in my cast iron skillet with some cooking wine to keep some juicy-ness in there, but I can't wait to try this crock pot idea. Brilliant! Thank you! I am one that would pass on grilled chicken breast as well because it's so dry. This is a great idea! Love this!! I'll be trying this sometime this week! Thanks! I use salsa for all sorts of foods. Boca burger TACOS are a favorite. LOL You are so funny. been awhile since I've had hockey pucks. I found that chicken breasts are best when cooked on the bone, skinless of course. Our Big Green Egg cooks them and they are so moist, The last time I cooked boneless brests, I cooked them so long you could hardly swallow them because they got stuck in your throat. Lisa, love the recipe!!! Love the article!!! please keep it up! But what gets me the most is it's only 3 ingredients!!! Kudos Keep up the good job!Stop by crockpotking.com when you have a chance your all invited! Mix all of this together & add chicken. Discard marinade & bake chicken @ time & temp you'd normally do for the size of pieces used. It's great with rice or to put on tortillas with salsa. One of the easiest things for me with boneless, skinless chicken breasts is to marinate them. Even this is easy, when I bring them home I break them down, add my fav low fat salad dressing and stick in the freezer, as they defrost they marinaate themselves and with so many different flavors it's easy to indulge my whims.